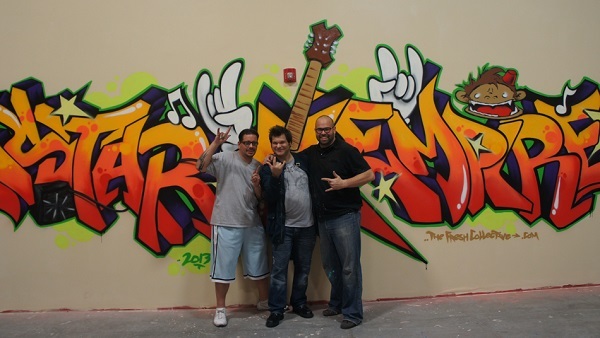 A few weeks ago two talented artists from The Fresh Collective stopped by to help out with the Empire’s progress. Within hours they took a large, naked white wall one side of our space and turned it into a masterpiece! I had the opportunity to watch them for a little while as they worked and it blew my mind. They took the sketches that we had discussed in the weeks prior and basically free-handed the entire piece! You can see from the pictures below just how big this tag became, and to give you an idea Elan (the tall guy in the black shirt) is almost six feet tall! An idea to provide talented up and coming artists with a community, two high school friends took their passion for art to the next level. Created by Elan Wonder and Chek Roka, these two street artists from Elizabeth, NJ seek to redefine the urban experience while celebrating the culture. Along with artist Mimik, The Fresh Collective have been offering their talents and services everywhere. Besides seeing their work in All Star Music Empire, you can also visit Red Bank Sub Shop or Monmouth CrossFit. If you’re looking to get your own personal piece done, check out their services to find what you’re looking for! This awesome mural is a great centerpiece that embodies what the Empire is going to always be about!